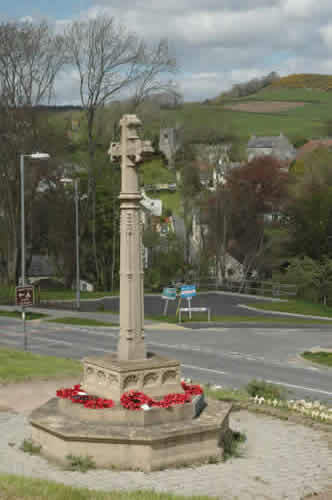 What a position for a War Memorial, set high above the village alongside a busy main road. No possibility of forgetting these men - just lift your head as you come out of the distant church on Sundays and you will be reminded of them. Drive up the hill in your carriage or cart and you will be reminded of them. Curious then, that this is one of those few Devon monuments on which are recorded the men's names in order of military rank. Today, this seems pointless to us - they all made an equal sacrifice, irrespective of who they were. Vernon Rattenbury has written about them in alphabetical order which makes that clear but should you visit the memorial in person, be prepared to seek out individual names in rank order.on the plaques attached to the octagonal base. Private 1st/4th Battalion, Devonshire Regiment. Percy Bate, a resident of Uplyme, enlisted in the Royal North Devon Yeomanry at Exeter before being transferred to the 1st Battalion, Devonshire Regiment. He was killed in action on the Somme. Son of Thomas and Susan Bate of 84 Clovelly, Devon. He has no known grave and is commemorated on the Thiepval Memorial, Somme, Fracne, pier and face 1C as well as on the Uplyme Memorial. Enoch Bowdirtch was a farm labourer before the Great War and a resident of Uplyme, The son of James and Harriet Bowditch of Hawkchurch, Devon ,he is buried in Colchester Cemetery, Grave 1.15. 80 and is commemorated on the Uplyme Memorial. Private, 2nd Battalion, the Canadian Mounted Rifles, the British Colombia Regiment. Died 24 August 1916 - Somme, France. Charles Gale enlisted in Lyme Regis the son of Frederick and Elizabeth Anna Gale of Eveleigh Cottage, Uplyme, He is buried in Amara War Cemetery, Iraq, Grave XIV.B.6 and is commemorated on the Uplyme Memorial. Frederick Gale died of his wounds. The son of Frederick and Elizabeth Anna Gale of Eveleigh Cottage, Uplyme and the husband of Marian Gale (née Bisson, she came from Jersey) of 3 South View, Chertsey Lane, Staines, he is buried in Bac-du-Sud British Cemetery, Baileulville, France, Grave I. E.27 and is commemorated on the Uplyme Memorial. Private,"D" Company, 2nd Battalion, Devonshire Regiment. Albert Gudge enlisted in Exeter and died of his wounds. The son of Joseph and Ellen Gudge of The Haven, Harcombe, Uplyme, he is buried in Sailly-sur-la-Lys Canadian Cemetery, Pas de Calais, France, Grave II.A.6 and is commemorated on the Uplyme Memorial. Born 2 April 1894 in Harcombe, Devon. Died 21 February 1917 in Salonioka, Greece. Captain, 1st Battalion , Royal Marine Light Infantry, Royal Naval Division. Died 8 May 1917 in the United Kingdom. Valentine Jones died of his wounds after being evacuated to England. The son of General Sir Howard Sutton Jones, K.C.B and Lady Katherine Louisa Anmelia Jones of Mona House, Uplyme. He is buried in Alverstoke Churchyard, Hants, and is commemorated on the Uplyme Memorial. He died in London from exhaustion following scarlet fever, having been wounded 28 April 1917 at the Battle of Arras. He was killed in the Battle of Festubert aged 34 leading his ompany in an attack on the German trenches on the night of 16-17 May 1915. The eldest son of General Sir Howard Sutton Jones and Lady Katherine Louisa Jones of Mona House, Uplyme and brother of Valentine Jones (see above). He is buried in Guards Cemetery Windy Corner, Cuinchy, France. Son of Walter and Emma Jane Marchant of St Mary's Uplyme, he is buried in Uplyme churchyard and is commemorated on the Uplyme memorial. and is commemorated on the Uplyme Memorial. Born in 1894 in Dalton, Lancashire. William Smallshaw enlisted in Exeter, the son of William and Margaret Smallshaw (née Fairclough) of Woodhouse Cottage, Uplyme. He has no known grave and is commemorated on the Basra Memorial, Iraq, Panel 11and is commemorated on the Uplyme Memorial. He was killed during the Third Battle of Ypres. Son of Harry and Henrietta Maria Stocker of Loom Cottage, Uplyme. Husband of Bessie Stocker of 12 Sherborne Lane, Lyme Regis. He has no known grave and is commemorated on the Menin Gate Memorial, Belgium, Panel 53 and 55, on the Uplyme Memorial and on Lyme Regis War Memorials in the parish church and in the town. Walter Stocker, known as George, enlisted in the Royal Navy in 1912. He won the Distinguished Service Medal "For services rendered whilst attached to a landing party from HMS Doris at Alexandretta, 6-7 January 1915." He was drowned at Malta, the son of Harry and Henrietta Maria Stocker of Loom Cottage - he is buried in Capuccini Naval Cemetery, Malta, Plot 53 and is also commemorated on the Uplyme War Memorial. NB His name appears as "George" on the War memorial and as a Gunner in the army which is incorrect. Died 16 July 1918 at Pas de Calais, France. The son of John and Alice Stocker of Eveleigh Cottage, Uplyme. He is buried in Aubigney Communal Cemetery Extension, France, Grave IV. F.13 and is commemorated on the Uplyme Memorial. Herbert Street enlisted in the Royal Navy on 22 October 1912 and was killed when HMS Amphion struck a mine off the Thames estuary. The son of William and Amelia Street (née Cox) of Rocombe. Uplyme, he is commemorated on the Plymouth Naval Memorial, Panel 3 and is also commemorated on the Uplyme Memorial. Arthur Thoroton lived in North Acton, Middlesex and is buried in Acton Cemetery, Section C, Row D, grave 32 and is commemorated on the Uplyme War memorial. 4711 Private Herbert Turl was a resident of Uplyme and has no known grave. The son of Tom and Elizabeth Turl of Whalley Lane, Uplyme. Born in Colyford in 1898. Died 21 August 1916 aged 18. He is commemorated on the Thiepval Memorial, Somme, France, pier and face 5A and 6C, and is also commemorated on the Uplyme Memorial. Clifford Wheadon died during the Passchendaelle campaign . The son of Matthew and Alice Wheadon of Roccombe, Uplyme, he is buried in Bedford House Cemetery, enclosure No.4 IV.K.15 and is commemorated on the Uplyme Memorial.